A large explosion was reported Wednesday morning at an ExxonMobil oil refinery in the southern California city of Torrance. Law enforcement officials in Torrance, southwest of Los Angeles, described the incident to the LA Times as a “second-alarm fire explosion” that occurred at around 8:50 a.m. local time early Wednesday, according to the refinery’s own account. A local NBC News affiliate said there have been reports of two individuals suffering from minor injuries as of 10:30 a.m. PST. Some area schools have ordered people to “shelter in place” as the cause of the explosion is investigated, according to local media reports. "Emergency procedures have been activated to address the incident, and employees are working with the appropriate agencies," a public affairs official with ExxonMobil said in a statement given to NBC News on Wednesday morning. "Our main concern is for the safety of our employees and our neighbors. We are accounting for all personnel and still evaluating the cause of the incident, or the occurrence or amount on any damages." 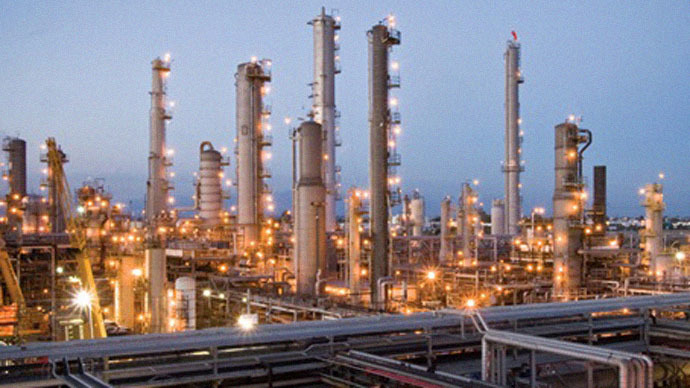 According to local news network KTLA, the ExxonMobil refinery encompasses roughly 750 acres in Torrance, CA and processes upwards of 155,000 barrels of crude oil each day. Details are still developing, but the Torrance Police Department told reporters at the LA Times that there is no evidence of any air quality issues. Witnesses claim the explosion caused the ground to shake similar to the effects of an earthquake, however, and said they saw ash falling from the sky, according to the paper. "I thought it was an earthquake, like someone hit the back of my car," resident Drew Magtoto told NBC News after the initial explosion. "There's still smoke coming out, but it wasn't as bad as earlier." Another resident, according to the network, said he could feel the explosion from around seven miles away.